If you are experiencing one of more thin white lines that travel the entire length of a printed card and the problem persists with every card, it is possible that you have a chipped, scratched or externally damaged printhead. It is also possible that it could be a blown pixel in the printhead. 1. Clean the printer. Make sure to take special care when using the printhead cleaning pen to remove any particles stuck to the printhead. 2. Visually inspect the printhead for any remaining dirt. 3. Attempt to reprint one of the cards. 4. If the problem still persists, carefully remove the printhead. 5. Using a magnifying glass, inspect the glass edge of the printhead for scratches, chips or external damage. 6. If no damage is noticed, the printhead may have a blown pixel. Printheads are only warrantied by evaluation processes through Fargo technical support. RMAs are needed for an evaluation to occur. If you see visible damage on your printhead, it will not be covered under your warranty, and you must purchase a new printhead. 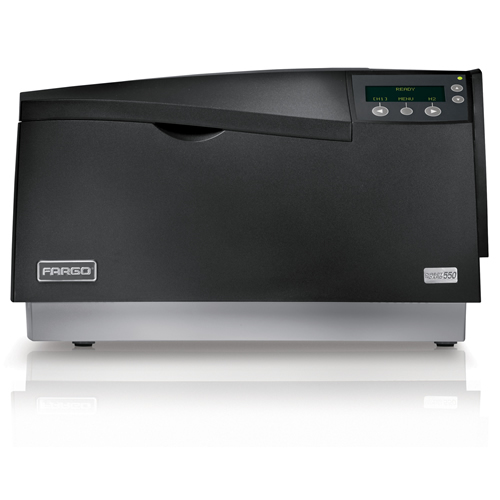 For more information about Fargo printers and the Fargo DTC550 printer, our ID card experts can be reached at 888-485-4696. This entry was posted in Fargo Printer and tagged Blown Pixel, Fargo DTC550, printhead, Printhead Damage, White Line on March 22, 2010 by SafeCard ID Team.